So i'm about to begin my journey into the world of homebrewing. I'm a research chemist, and I love beer, so what better way to combine the two things I love, science and beer. 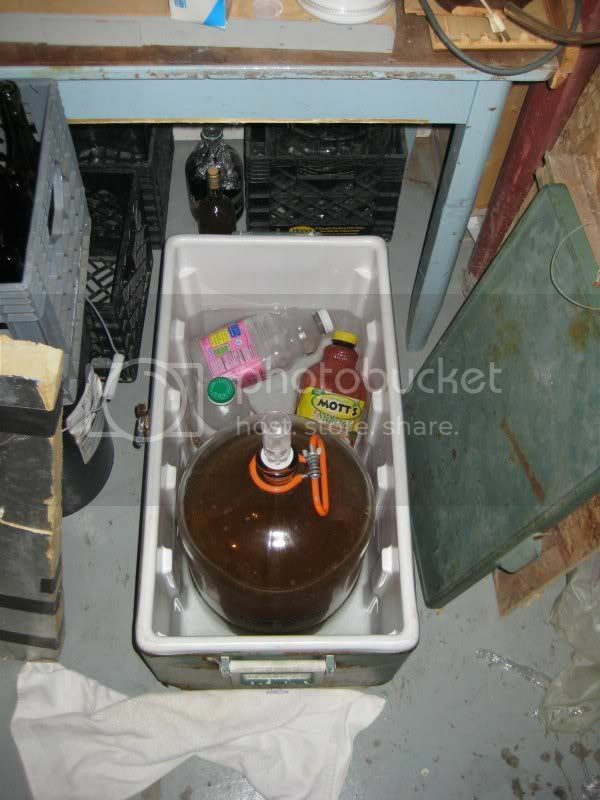 I purchased a starter kit with an ale recipie, now I'm anxiously waiting for it to ship. Space for me is limited in a 1 bedroom apartment. I have a walk in closet in my living room that I cleared out a corner for storing my fermenter. My only concern is that during the summer months in NJ, temperatures have been in the upper high 80s to upper 90s. My apartment is air conditioned but it's not running all the time. With a temperature of about 80F, am I going to run into problems during fermentation? My second question: How important is it to boil the amount of water it says to start? Is it ok to boil less and add the malt to that, and then bring it to volume while cooling it down? Is adding ice into the fermenter a viable option for cooling down the batch before you add yeast? If you have enough room for your fermenter in your closet, you probably have enough room for a swamp cooler in your closet. Basically a big tub to put the fermenter in, fill the tub with cold water to act as a heat sink. Better yet, put some frozen water bottles in the tub too and rotate them from freezer to swamp cooler to regulate the temp. A wet tshirt over the carboy (wicking the water up out of the swamp cooler) and a fan blowing across it will help even more. Some rough examples clarify this relationship. At 32 °C (90 °F) and 15% relative humidity, air may be cooled to nearly 16 °C (61 °F). The dew point for these conditions is 2 °C (36 °F). At 32 °C (90 °F) and 50% relative humidity, air may be cooled to about 24 °C (75 °F). The dew point for these conditions is 20 °C (68 °F). At 40 °C (104 °F) and 15% relative humidity, air may be cooled to nearly 21 °C (70 °F). The dew point for these conditions is 8 °C (46 °F). 80F is too hot for fermentation (well, it will ferment, but you won't like the results). Again, I'd use an ice/cold water bath to cool to pitching temps. When you can, get/make an immersion chiller that will hook up to your kitchen sink. As for boiling, the amount isn't critical but ideally, boil as much as your pot will allow. 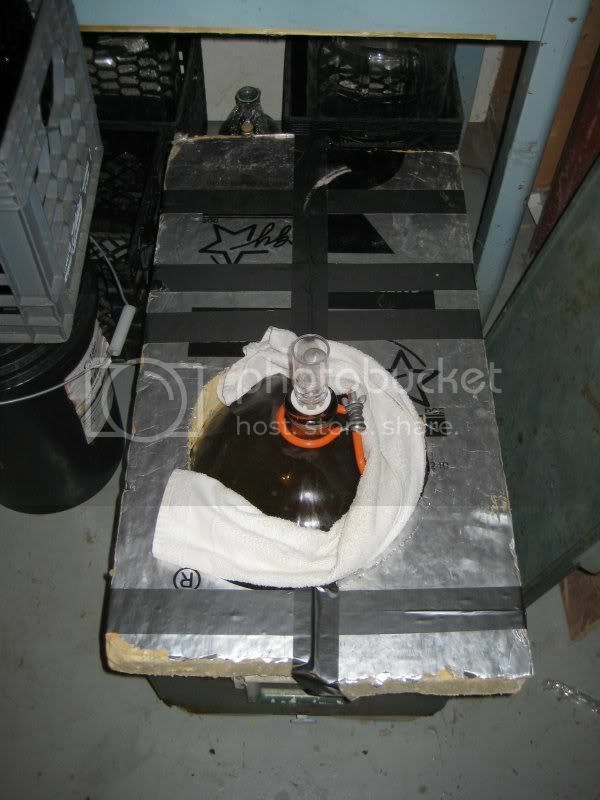 Adding "top off" water after the boil is standard procedure for most extract brewers. If you include ice as part of the "top off" volume, it's probably a good idea to not use storebought bagged ice as that stuff is pretty dirty. Welcome to the hobby/obsession--you'll love it. Temps do matter during fermentation. Certain yeast and certain styles call for certain temps. Fermenting above 75 F usually means generating fusel alcholols (headaches!) and off aromas and flavors. Look around the forum for ideas about how to cool things down a bit. The only live organism that should be introduced to your chilled wort is your yeast. That is why you must boil all your water (to kill all bacteria and wild yeast). Adding unboiled tap water or ice cubes to the post boil wort is not a good idea. You run the risk of infecting the wort. If you don't want to boil the full batch, you can pre-boil some water and set it aside (or cover it and chill/freeze the water in the fridge/freezer the day before. That'll help chill your wort when you transfer or top off in the fermenter. Hey thanks for the advice! I'll definately look for a cooler/fan set up or something to fit the fermenter in and keep it cool with some ice packs/towels etc. The upside of it is, that it is dark, and I will be starting off with an ale. My fiance already said I should get something to put the fermenter in. Hopefully the fiance likes beer too. Things go much smoother if you can enjoy a homebrew together - and if there is a style or type of beer she enjoys, brew it! I'm a chemical engineer myself, plus I love to cook and love being creative, so I know exactly what you mean about homebrewing being the perfect hobby. I started out with the same enthusiasm as you, and now I've been brewing for 11 years already. Time flies... If you stick with it and are truly interested, you will learn a lot along your journey. You can start out making pretty good beer, but as your experience grows you will become capable of making better beer than anything you can buy or that your buddies can make. Here are some things to help get you started on the right track, based on my experience. Some of these have already been answered above, but I'll go ahead and say the same things in my own words because I've already drafted it and I sometimes don't know how to shut the hell up. First of all, you'll want to get that fermentation temperature down by any means possible! You can make some decent beers at temperatures above 70 F, but not without risk of being very fruity, alcoholic, and causing major headaches (literally). If you can shoot for fermentation temperature of 65 F, with an absolute maximum of 70 F (okay for most ales, but not lagers), you will be much happier with your final product. Stick with ales for your first couple years. Lagers are a whole 'nother beast. If you can tune your A/C at least another 5 degrees lower, it won't solve the problem completely, but will help get you much closer to where you need to be. You can cool it down even more in many other ways. It could require some labor and ingenuity, but one fairly obvious method is to modify a little dorm fridge and add a temperature controller to get you down into the 60s (or even lower). There are details of such products elsewhere on the various homebrewing forums, and I haven't done it myself, so I won't comment further. But even easier - If your relative humidity cooperates, you can cool your fermenter very cheaply and effectively through evaporative cooling - set it in the coolest corner of your apartment (wherever that may be), cover with a soaking wet t-shirt, set in a small tub a couple inches deep with water, and blow a fan on it. Check the t-shirt and tub every 12 hours or so and make sure it stays moist with a couple inches of water in the tub to allow a wicking effect. In my experience, this wet t-shirt and fan method should lower your fermentation temperature by around 5 degrees, maybe a tad more. Some people put ice in the tub as well, but my scientific mind is not convinced that this really has much effect. An alternative method, though, might be to immerse the entire fermenter in a tub of ice water, but you would need to add more ice every couple of hours, which is probably not the best means of temperature control, but maybe it would work. I just really like the plain old t-shirt and fan method - cheap and effective. I would NOT add ice straight into the fermenter, because it could harbor wild yeast and bacteria that could harm your beer. It is not so easy to sanitize ice - you cannot boil it, for obvious reasons! There are many ways to get to your desired volume. You can indeed do a concentrated boil. I did so for many years and made great beer with it. However, boiling the entire volume will result in lighter color and less caramelly flavor. So it also sort of depends on what style you are making and what flavors you want. If making a stout, obviously you don't care about darkening or deep malt flavors. But if making a cream ale, you probably don't want it to turn out brown and caramelly. So take it into consideration. Best of luck to you. We are a good, smart bunch of guys here and will respond pretty quickly to any questions. This is perfect! Thanks for sharing, and thanks for welcoming me to the message board. The Kit should arrive 7/1, which i guess is tomorrow, so hopefully I will be brewing soon. Eventually I would hope to move to better temperature controls and the like. And my fiance likes having the idea of beer always on tap when we buy a house :-) Right now I will go with simple. And as for lagers and ales, Ales have always been my favorite come to think of it, so that's what i'm starting with. I'm a big fan of Triumph's Amber Ale at the moment. My only advice is to get the Palmer book today - it really helped me when the kit instructions were incomplete and vague. and join a homebrew club - that way help is only a phone call or e-mail away and you can usually find a brewpot to borrow or an extra carboy if needed. Great advice. Club members have made every mistake you will ever think (or not) of making and will help you avoid or correct them. Welcome! Good luck. Get the next batch ordered. You will quickly realize that you can run out of homebrew waiting for the next batch to ferment and finish its magic. My kit came yesterday and I'll be out most of the weekend, but with monday off, I'm thinking it'll be the perfect time to brew the first batch of "Mad Scientist"
Edit: My fiance has already requested her own batch of beer... Something along the lines of a blue moon. Doesn't need to be an exact copy, but something with an orange-citrusy flavor (I guess even something along the lines of a magic hat no. 9 but with orange), so if anyone knows if this is too difficult to do yet, or has a link to some kits, let me know.